Low cost printing. Spend less time replacing supplies and help reduce operating costs by using Brother Genuine super high-yield 6,500-page replacement toner cartridges (approximate yields based on ISO/IEC 19798). Convenient mobile device printing and scanning (requires connection to a wireless network). Print from your mobile device via: AirPrint, Google Cloud Print 2.0, Mopria, Brother iPrint&Scan, Cortado Workplace, Wi-Fi Direct, and NFC. Plus, wirelessly scan to your mobile device with the Brother iPrint&Scan app. 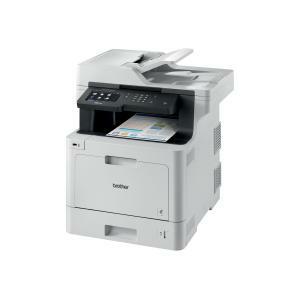 The Brother MFC-L8900CDW color laser All-in-One is ideal for offices and small workgroups with higher print volumes. Super high-yield 6,500-page replacement cartridges (approximate yield based on ISO/IEC 19798) deliver low cost, business quality output. Print/copy up to 33ppm. 5.0" Touchscreen display. Automatic duplex print/scan/copy/fax. 70-page capacity auto document feeder. Legal-size scan glass.